The czars ruled the expanse of Russia from within the Kremlin ("citadel") walls. This historic fortress-palace is matched in size only by the Forbidden City in China. 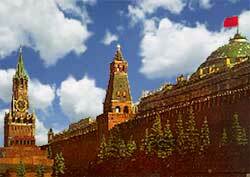 The Kremlin is completely enclosed by high defensive walls punctuated with a series of 17 strategic towers. One of those towers is the 70-meter (230-foot) Savior Tower. It dominates the Kremlin skyline (see left spire in photo). The rulers built ornate buildings that collectively make the Kremlin an architectural buffet. These structures include palaces and government centers. There are even three full-sized cathedrals clustered in the Kremlin's main square. One of those cathedrals has the tall Ivan the Great Bell Tower. At its foot rests the Czar Bell, the world's largest. Unfortunately, during its casting days, a huge chunk broke off. The bell was never rung or placed in its intended belfry. Not to be missed is the Kremlin Armory (now a museum). It hosts many treasures including czarist crown jewels and opulent carriages dating back to the 16th century. The famous Faberge eggs are also on display.